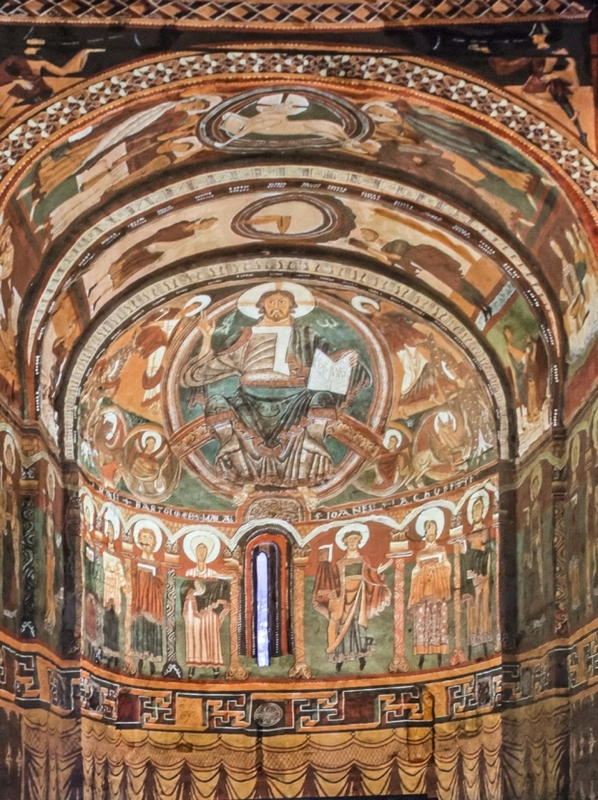 Image of the current virtual projection of the Romanesque paintings in Sant Climent de Taüll. Original paintings in the Museu Nacional. The church of Sant Climent de Taüll, situated in the valley of Boí (Alta Ribagorça) and declared a world heritage site of Humanity by UNESCO in the year 2000, has offered since 2013 an innovative presentation of its Romanesque paintings, by means of a virtual mapping video that recreates, within the greater apse and the presbytery of the central nave, the original frescos, that are currently to be found in the Museu Nacional. The mapping of Taüll doesn’t only project the frescos of the museum just as they could be seen in their original place, but in addition allows us to see how these mural paintings were in their totality in 1123, and also the remains of the original painting that have stayed on the wall of the apse, previously hidden behind the old painted copy on plaster which is now substituted by the digital projection. Recuperation of the remains of the original painting in the church of Sant Climent. Photograph by Mercè Marquès. 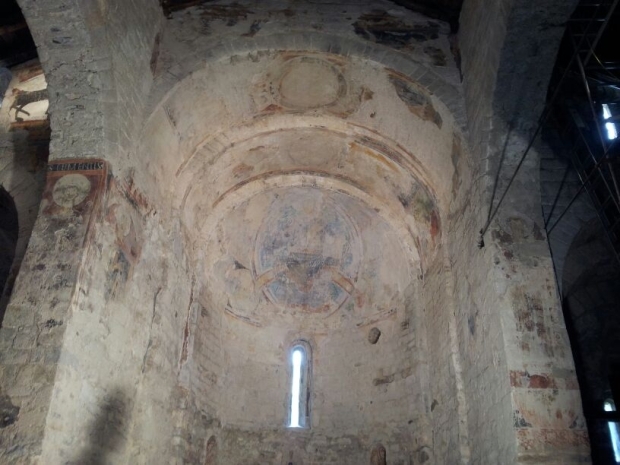 The new museum project for the church of Sant Climent forms part of the programme of restoration and improvement Open Romanesque, in which the museum has collaborated, given that it is the conserver of the original paintings that are permanently exhibited in the rooms. The current location of the frescos took place because, at the beginning of the 20th century, Romanesque art was the focus and target of buyers, collectors and art merchants, and thus the paintings were taken down and moved to Barcelona between 1919 and 1923 to prevent them from being stolen. 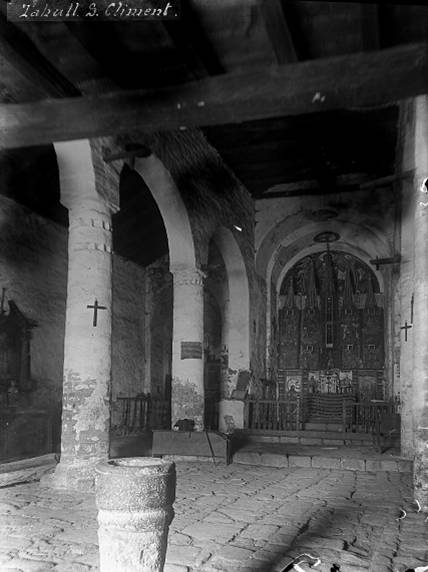 Sant Climent de Taüll, 1904. Photograph by Lluís Domènec i Montaner, Archive of the Official College of Architects of Catalonia. 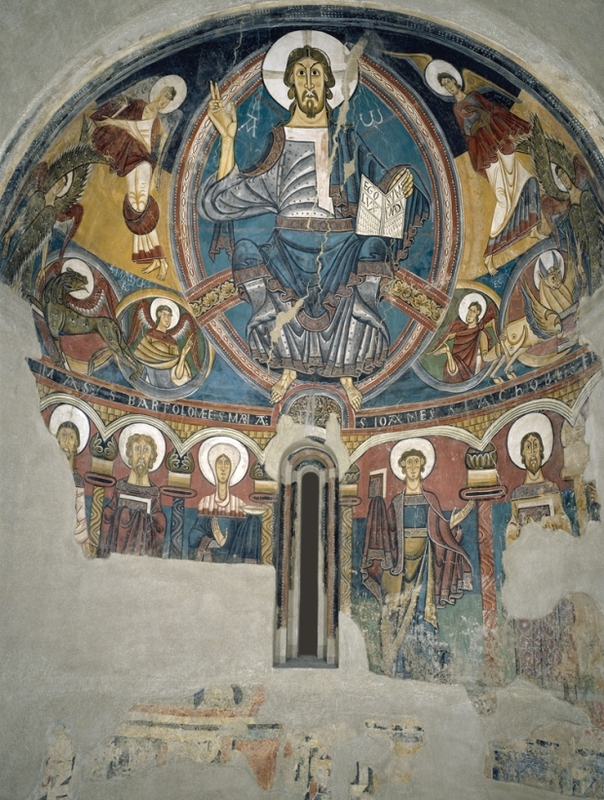 In the carrying out of the virtual apse project, while in Taüll the team led by the Centre of Restoration of Properties of the Generalitat de Catalunya intervened in the Romanesque original paintings remains localised in situ, the Area of Restoration and Preventive Conservation of the museum worked in parallel on the set of original paintings preserved. In the museum, two actions were carried out: the extraction of the samples of polychrome to complete the existing analysis and the elaboration of some tracing of all the painting of the apse that there is in the museum, to be able to compare them with the remains that were found in the church of Sant Climent in the deep layers of the wall, under a blue paintwork that covered everything. The tracing done in the museum helped to certify the remains found, given that they coincided exactly with the polychrome of the original. The paintings of Sant Climent de Taüll in the museum have never been restored in an integral way, so therefore both due to the tracings and so as to know the current state of conservation of the fresco, a scaffolding was installed in the inside of the architectural recreation of the apse in the museum so as to be able to gain closer access to the original paintings. Then, various aspects were looked at such as, for example, the transfer fabrics with the polychrome, the cutting lines of these fabrics, the nails with which they were subjected to the wooden grid, the chromatic reintegration produced in the moment of assembly, or the signs of preliminary drawing. 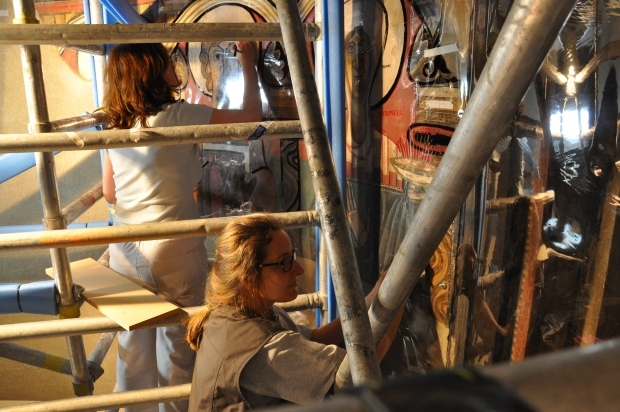 Núria Prat and Paz Marquès, restorers of the museum, tracing on the lower floor. The taking of samples, carried out by the chemist of the museum, Núria Oriols, both in the museum and in Taüll, has completed a previous extraction and helps to know better the execution technique: brush strokes, application of colours, overlays, thicknesses of the layers, chemical alterations of the colours, possible metallic applications, etc. Núria Oriols: sample from the lower floor of the paintings of the museum. Photograph by Paz Marquès. 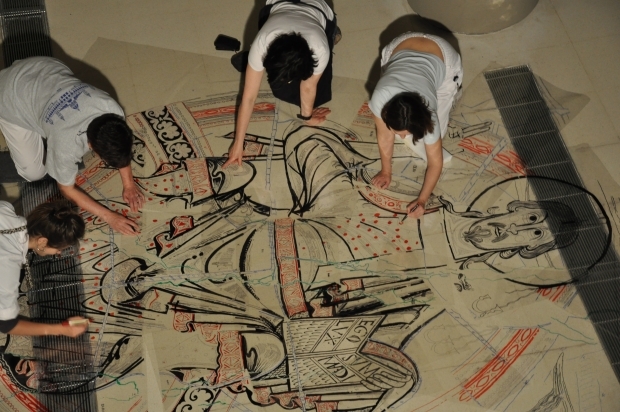 Doing a tracing of mural paintings is a habitual practice to obtain information. All the prior work had been planned: the legend of the colours chosen in a conventional way, a quadrature system, the sheets of transparent paper, etc. 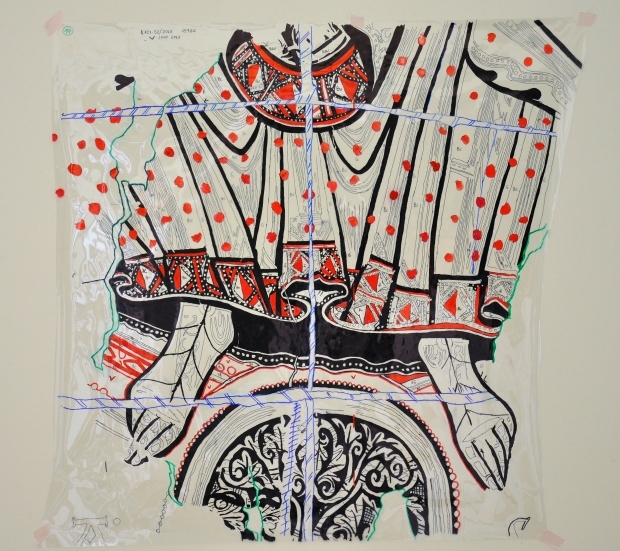 However, how would we fix the polyester paper to the polychrome? A special tape could help, but it wasn’t enough when the upper area of the semi-dome was curved in a horizontal and vertical sense. Some magnets were to be our solution and we placed them on the iron nails which had been used to mount the paintings on the support. 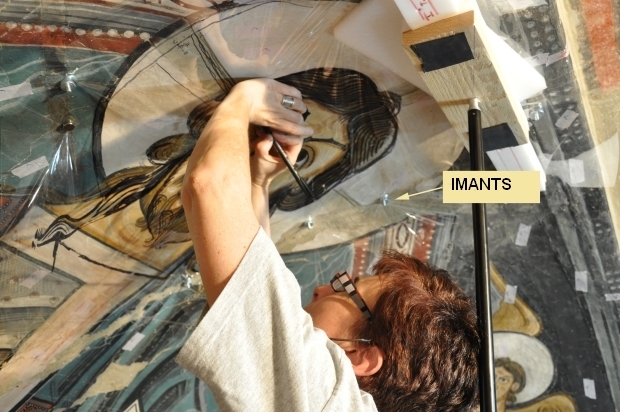 Anna Carreras, restorer of the museum, tracing the face of Christ. Photograph by Paz Marquès. 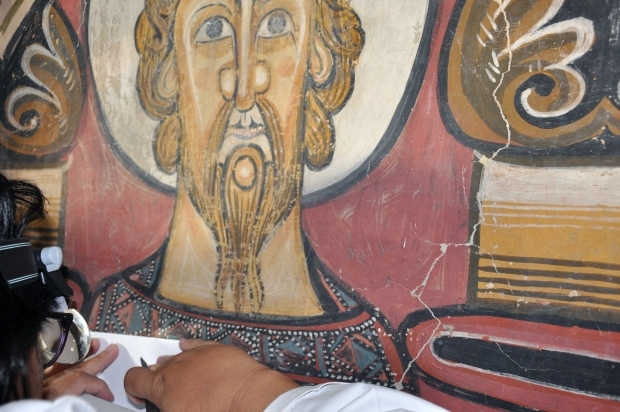 The state of conservation of the apse with the original paintings is, in general correct. Nowadays we are continuing to analyse and work on all the data extracted from a work carried out 10 months ago and we hope to obtain interesting results. Result of the tracing of the feet and the tunic of Christ in Majesty. Photograph by Paz Marquès. 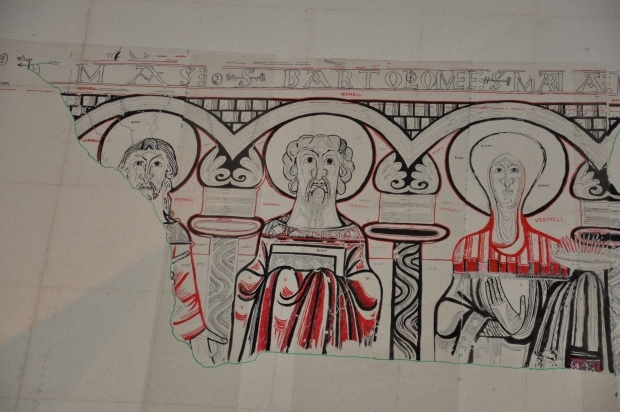 Tracing on the left-hand side of the lower floor of the apse of the museum. Photograph by Paz Marquès. The virtual apse of Sant Climent de Taüll has won various awards for its decisive contribution to the diffusion of heritage. And the recognition we also feel is a little ours too! Restorers assembling all the fragments on the floor. Photograph by Paz Marquès.